AVG Online Price is £29.95! *This is a Digital Download Product - We will eMail you a license key seperate to your order and instructions/link to download the software Directly from AVG. You then install and activate using the key we issue you. There are NO refunds on this item once it has been issued/emailed to you. Good value for a years usage. A few extra features. 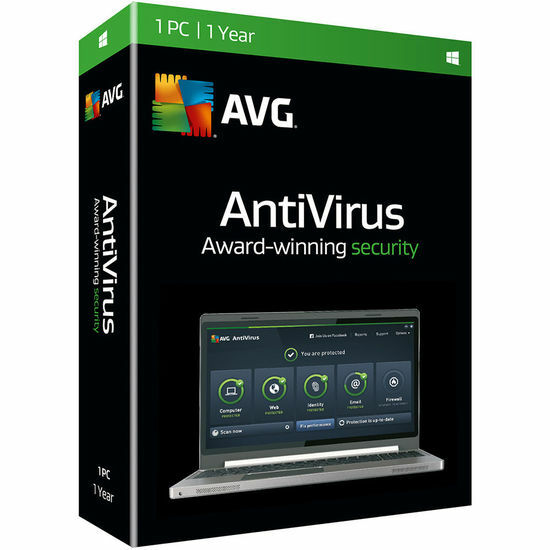 I have used AG for several years, bought direct from AVG. When I saw this offer I could not refuse - more than £20 cheaper for the same product. Code came through very quickly and was easy to install. Got this product bundled with laptop. Have used AVG Free for years with no breach of security. You may consider it at this low price for convenience and a few added features, but is not significantly better. I am more than happy with my AVG antivirus 2016. AVG sorted 82 malware issues with a scan, but it also stopped all gmails coming thro. The gmails reappeared when I removed AVG. So, assuming I operated AVG correctly, it was v good for a temporary installation. I have returned to Avast, and may subscribe to Anti Malware Bytes. So my verdict - good value for money, but use AVG with caution! This would havebeen caused by AVG's default configuration blocking the SSL requests from Gmails servers. Please check the configuration and refer to AVG for assistance they will be happy to advise you on how to remedy this settings related issue so that you can use AVG fully.